By now the interview on Fox with Jon Stewart by Chris Wallace has become viral and been covered from many different angles. This post is a review of the interview offering video clips of the original interview in its entirety, the two segments that differed between the unedited version and the Fox version, Jon Stewart's follow up on The Daily Show regarding the debunking of his claim that Fox viewers are the "most consistently misinformed" and commentary about Fox in general and Chris Wallace specifically regarding his . The edited version of this clip that Fox showed also comes from the same Crooks and Liars story. Notice the sudden jumps in expressions on Stewart's face. Now, for those who have not seen the entire, unedited 24 minute interview, this is it via Mediaite. Some outlets have taken issue with PolitiFact's findings. People, who follow Glenn Beck, certainly have a screwy understanding of reality. Just one example, nearly all of them falsely believe that George Soros was a Nazi collaborator. lies, misinforms, smears, distorts, quotes out of context, etc. That's what the “balance” of Fox News is all about – advancing the misinformation that can never be fully corrected by contrary information in the eyes of its viewers. However, if he was basically correct about Fox's viewers, Stewart's respect for Chris Wallace seems misplaced. 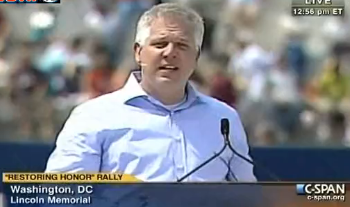 When Beck was first hired by Fox, Wallace and Fox host Shepard Smith had an exchange of words about Glenn Beck. As reported by Think Progress in March of 2009, "Shep Smith repeatedly mocked Beck and the program, admitting that although he watches Beck’s show, he does not listen to it. Smith also pointed to a giant satellite truck parked outside and wondered if it was for Beck’s “ego.” Chris Wallace told Smith he must be jealous:"
SMITH: Do you even understand this Glenn Beck Friday? Because I really don’t. WALLACE: Well, I do, and what pains me — and you know, Shep, how highly I respect you — is you seem upset by Glenn Beck Friday. SMITH: He is the greatest star of all time! SMITH: I am here to worship him. WALLACE: –and you seem to be begrudging — you’re begrudging him his success. “We are here to celebrate, worship, and adore,” Smith told Wallace. This exchange begs the question why is a decent reporter like Smith working for a channel like Fox? One can only wonder at this point what Wallace thinks of the megalomaniac, Beck, now. In conclusion, Fox is not fair. If Fox were fair, they would not have taken out the part where Wallace admits that Fox offers the "other side" to MSNBC and Stewart's reference to Bill Sammon giving marching orders. Wallace's statement demonstrates that Fox is not balanced. Fox is the other side, the conservative/reactionary point of view. Most observers readily grasp this about Fox, but they still engage in the false advertising by claiming to be "fair and balanced." If that were all Fox was about, Glenn Beck would not have lasted there for 30 months. Beck lies too often to be an acceptable commentator there if Fox were only offering a conservative perspective on news stories and a rightward spin of the truth. Many of the lies that Stewart listed in his follow-up segment on The Daily Show were lies spewed by Beck, and there are many, many more. Fox hosts and their guests routinely distort the facts, make false claims, engage in hyperbole, make baseless accusations, hype bogus theories, propagate evidence-free attacks, etc. on a fairly routine basis. Their journalists, good (S. Smith) and bad (Wallace), are fig leaves masking what Fox president, Roger Ailes, has actually put together, i.e., a channel of right-wing propaganda. Fox is not news, and they do not provide accurate information. Fox is a right-wing propaganda outlet that tells conservatives and reactionaries what they want to hear which is not the truth. That is not the only condition that explains how a liar, hate-monger, fear-monger, yellow propagandist, race-baiter and bizarre conspiracy theorist like Glenn Beck lasted there for 30 months; but it serves as the most likely explanation for why he survived this long there. 1) "Jon Stewart Gets It Right About Fox News"
Fox News has attacked Daily Show host Jon Stewart for claiming that Fox News viewers are "the most consistently misinformed viewers" of cable news. However, Stewart was correct -- Fox News consistently misinforms its viewers and its viewers, are found among the most likely to hold misinformed beliefs about current events. PolitiFact.com Dubiously Rates Stewart's Remarks "False"
Fox News Cites PolitiFact.com's Analysis Of Stewart To Attack "Stewart's Spin"
Stewart: "Who Is The Most Consistently Misinformed Media Viewers? ... Fox Viewers, Consistently, Every Poll." PolitiFact Dubiously Rates Stewart's Remarks "False"
So we have three Pew studies that superficially rank Fox viewers low on the well-informed list, but in several of the surveys, Fox isn't the lowest, and other general-interest media outlets -- such as network news shows, network morning shows and even the other cable news networks -- often score similarly low. Meanwhile, particular Fox shows -- such as The O'Reilly Factor and Sean Hannity's show -- actually score consistently well, occasionally even outpacing Stewart's own audience. STEVE DOOCY (co-host): Here's the problem. Politifact, which is the Pulitzer Prize-winning website - they've got the Truth-O-Meter - they said that what he said is absolutely false. And, Exhibit A, ladies and gentleman and the folks over at Comedy Central, take a look at this. This survey was conducted by Pew Media. It was their consumption survey, and it asked cable news network viewers a series of four questions to test how much they knew about what was going on in the world. DOOCY: So the Fox News viewer is the most informed of the cable news according to Pew, Johnny. MacCALLUM: He didn't reference any polls. I'd love to know what polls he's talking about. BRIAN KILMEADE (co-host): He said all the polls. KILMEADE: So he's already proven [in]correct. Politifact often does a good service checking the veracity (or lack thereof) of controversial claims made by public figures. But they seem to have encountered some difficulty fact-checking Jon Stewart's claim that Fox Viewers are "the most consistently misinformed media viewers." Politifact maintains that Stewart is wrong about Fox viewers, based on the findings of five different polls. Three were conducted by the Pew Foundation: 2007 Political Knowledge Survey, 2008 Media Survey, and the 2010 Media Consumption Survey. Two were conducted by the University of Maryland's Program on International Policy Attitudes (PIPA): 2003 Misperceptions, the Media and the Iraq War, and 2010 Misinformation and the 2010 Election. The three Pew polls measure how informed viewers are. They don't even belong in the discussion, because they don't go to Stewart's point. "Do you know who the Secretary of State is" or "what is the name of the Vice President" are questions that you can answer if you're paying attention. There is no shortage of people who go glassy-eyed and stupid while staring at cable news, and I'm proud to be one of them. I can feel the lull of Kathleen Parker's voice shaving points off my IQ. I might be able to tell you who the Secretary of Education is under ordinary circumstances, but freely admit that listening to Bill Bennett drone on about anything is enough to flip the switch on enough synapses that answering any question becomes a challenge. It's a guilty pleasure for people who don't smoke pot. On the other hand, the two PIPA studies measure how misinformed viewers are. That's a very different yardstick. Listening to Dana Bash may freeze a few neurons in the "off" position, and I may not get the news value that I should out of the segment, but unless she says something that is manifestly untrue I can't claim to have been misinformed. Generally speaking, readers viewed the three Pew studies -- which we saw as some of the strongest evidence undercutting Stewart's position -- as irrelevant because they were testing factual knowledge, and if someone got one of those questions wrong, it wasn't because they had been "misinformed" but rather because they were simply "uninformed." By contrast, many readers argued that the only legitimate way to test Stewart's thesis was to refer to the worldpublicopinion.org studies, since they tested the extent of beliefs that were the result of misinformation, whether it's Barack Obama being born in Kenya or the stimulus not creating or preserving a significant number of jobs. Steven Kull, the director of WorldPublicOpinion.org, wrote us after the story appeared to say that testing for lack of knowledge is not enough. "We analyzed the effect of increased exposure to news outlets. We found that with all other outlets, increased exposure generally resulted in less misinformation. However, for Fox viewers, on nine points of information, increased exposure correlated with increased misinformation. This was true of only one point of information for public broadcasting and MSNBC viewers, and two points of information for network news. This effect was found in the 2003 study as well. Fox viewers were the only group for whom increased exposure resulted in greater misinformation." The problem with Politfact's work on this is that they're really comparing apples and oranges. The Pew studies measured viewers' knowledge of certain basic matters that no one is actually suggesting Fox News misinforms its viewers on. No one is arguing that Fox News misleads its audience about which party controls Congress, what volcano erupted last week, or whether John Bolton's mustache is secretary of state. Jane Hamsher had a good response to this, pointing out that being "misinformed" and "ill-informed" are not the same thing. An avid watcher of Fox News would likely be able to identify the speaker of the House or the attorney general, but they're also far more likely to think the president was born in Kenya. Put another way, someone who erroneously believes that the Civil War was fought over "states' rights" and not slavery would still likely know which side of the war Robert E. Lee fought on. Rather, the issues on which Fox misinforms its viewers are on matters of fact that conservatives would like not to be true. For instance, one recent study that Politfact shied away from because conservatives "criticized its methodology" is the only one that actually measures public knowledge on the issues in question. That survey found that Fox News viewers were far more likely to believe, falsely, that most scientists don't believe climate change is happening, that there were no tax cuts in the stimulus, that income taxes have gone up, and that Obama wasn't born in the United States. It's fair to question whether or not respondents should be asked questions about what "economists" thought of the stimulus, but that problem isn't present with many of the other survey questions, which measure easily verifiable facts not subject to interpretation. [I]n an environment in which conservatives are more inaccurate and more misinformed about science and basic policy facts, the "fact checkers" nevertheless feel unduly compelled to correct "liberal" errors too--which is fine, as long as they are really errors. But sometimes they aren't. A case in point is Politifact's recent and deeply misguided attempt to correct Jon Stewart on the topic of...misinformation and Fox News. This is a subject on which we've developed some expertise here...my recent post on studies showing that Fox News viewers are more misinformed, on an array of issues, is the most comprehensive such collection that I'm aware of, at least when it comes to public opinion surveys detecting statistical correlations between being misinformed about contested facts and Fox News viewership. What Stewart obviously meant--and what I mean--is that when it comes to politicized, contested issues where the facts have been made murky due to political biases, it is Fox viewers who are the most likely to believe incorrect things--to fall prey to misinformation. A quintessential example of such an issue is global warming, or whether Saddam Hussein's Iraq possessed weapons of mass destruction or was collaborating with Al Qaeda. There are many, many others. People who use Fox News, either online or on television, are more aware of false rumors about the Islamic community center and mosque than those who do not. For example, respondents who reported a low reliance on Fox News stated hearing 1.4 rumors (out of 4) on average. In comparison, if the same respondent reported a high reliance on Fox News, they would report hearing 1.9 rumors on average, an increase of 35%. In contrast, reliance on other cable news networks, including CNN and MSNBC, does not influence rumor exposure. We can only speculate about why this is. For example, perhaps Fox News spent a disproportionate amount of time covering the issue. Pew Research Center's Project for Excellence in Journalism August 1622 News Coverage Index noted cable news "coverage [of the mosque controversy] was intense" with conservative commentators strongly attacking the proposed mosque project and devoting significant airtime to the issue (seehttp://www.journalism.org). We also cannot say whether this finding was due to exposure to Fox's hard news programming, its editorial programming, or its website. The survey did not distinguish between these different aspects of the news network. For example, a typical respondent who reported a low reliance on Fox News believed .9 rumors on average. If that same respondent reported a high reliance on Fox News, the average number of rumors believed increased by 66% to 1.5. There were cases with some other news sources as well. Daily consumers of MSNBC and public broadcasting (NPR and PBS) were higher (34 points and 25 points respectively) in believing that it was proven that the US Chamber of Commerce was spending money raised from foreign sources to support Republican candidates. Daily watchers of network TV news broadcasts were 12 points higher in believing that TARP was signed into law by President Obama, and 11 points higher in believing that most Republicans oppose TARP. Here's another way to look at the misinformation: In our poll, 72% of self-identified FOX News viewers believe the health-care plan will give coverage to illegal immigrants, 79% of them say it will lead to a government takeover, 69% think that it will use taxpayer dollars to pay for abortions, and 75% believe that it will allow the government to make decisions about when to stop providing care for the elderly. But it would be incorrect to suggest that this is ONLY coming from conservative viewers who tune in to FOX. In fact, 41% of CNN/MSNBC viewers believe the misinformation about illegal immigrants, 39% believe the government takeover stuff, 40% believe the abortion misperception, and 30% believe the stuff about pulling the plug on grandma. What's more, a good chunk of folks who get their news from broadcast TV (NBC, ABC, CBS) believe these things, too. This is about credible messengers using the media to get some of this misinformation out there, not as much about the filter itself. These numbers should worry Democratic operatives, as well as the news media that have been covering this story. Fox Repeatedly Misinforms About Unions, Often Smearing Them As Solely Responsible For States' Budget Problems. As Media Matters has noted, Fox News regularly attacks and misinforms about issues related to labor unions. For more information about Fox's false claims and misinformation about unions, SEE HERE. Fox Routinely Misinforms About Taxes, Often While Cheerleading Tax Cuts For The Wealthy. As Media Matters has noted, Fox News regularly misinforms about, and makes false claims while reporting on, issues related to taxes. For more information about Fox's false claims and misinformation about taxes, SEE HERE. Fox Regularly Misinforms About Jobs, Often While Attacking President Obama's Stimulus Plan. As Media Matters has noted, Fox News regularly misinforms about and makes false claims about jobs and unemployment, often while attacking the stimulus plan and other Obama economic policies. For more information about Fox's false claims and misinformation about jobs, SEE HERE. Fox Regularly Misinforms About Budget Issues, Often While Promoting And Advocating GOP Fiscal Policies. As Media Matters has noted, Fox News regularly misinforms about budget issues and often hypes and advocates for Republican policies. For more information about Fox's false claims and misinformation about budget issues, SEE HERE. Fox Regularly Misinforms About Housing, Often While Attacking Affordable Housing Policies Or Blaming Them For The Housing Crisis. As Media Matters has noted, Fox News regularly misinforms its viewers about housing issues, in many cases by demonizing affordable housing policies. For more information about Fox's false claims and misinformation about housing issues, SEE HERE. Fox Routinely Misinforms About Social Security, Often Attacking It As A "Ponzi Scheme" Or Misleading About Its Solvency. As Media Matters has noted, Fox News routinely misinforms about Social Security, attacking it as a "Ponzi scheme," or misleading about its solvency. For more information about Fox's false claims and misinformation about Social Security, SEE HERE. Fox Regularly Misinforms About Health Care Reform, Often While Fearmongering About "Death Panels," Rationing, And The Law's Cost. As Media Matters has noted, Fox News regularly misinforms about the health care reform law. For more information about Fox's false claims and misinformation about health care reform, SEE HERE. Fox Routinely Misinforms About Medicare, Often While Parroting GOP Talking Points, Advocating For GOP Proposals. As Media Matters has noted, Fox News routinely misinforms about Medicare. For more information about Fox's false claims and misinformation about Medicare, SEE HERE. Fox Repeatedly Misinforms About Reproductive Choice Issues, Often While Attacking Planned Parenthood. As Media Matters has noted, Fox has a long history of misinforming about reproductive choice issues, often by attacking Planned Parenthood or making false claims about the organization. For more information about Fox's false claims and misinformation about reproductive choice, SEE HERE. Fox Regularly Misinforms About Immigration Reform, Often While Promoting Controversial Anti-Immigration Laws. As Media Matters has noted, Fox News regularly misinforms about immigration reform, often while promoting the controversial anti-immigration law in Arizona and attacking or making false claims about the DREAM Act. For more information about Fox's false claims and misinformation about immigration reform, SEE HERE. Fox Routinely Misinforms About Border Security, Often By Distorting Obama's Record On Border Security. As Media Matters has noted, Fox News routinely misinforms about border security, often by distorting or making false claims about Obama's record on border security. For more information about Fox's false claims and misinformation about border security, SEE HERE. Fox Regularly Misinforms About Terrorism Issues, Often While Advocating For The Use Of EITs And Attacking Obama's Efforts To Combat Terrorism. As Media Matters has noted, Fox News regularly misinforms about terrorism-related issues, often while advocating for the use of enhanced interrogation techniques (EITs) and attacking Obama's policies to combat terrorism. For more information about Fox's false claims and misinformation about terrorism, SEE HERE. Fox Routinely Misinformed About START Treaty, Often While Claiming That The Treaty Would Harm National Security. As Media Matters has noted, Fox News routinely misinformed and made false claims about the Strategic Arms Reduction Treaty (START). For more information about Fox's false claims and misinformation about START, SEE HERE. Fox Regularly Misinforms About Race And Ethnicity. As Media Matters has noted, Fox News regularly misinforms about, and makes false claims while reporting on, issues related to race and ethnicity and has cheered Rep. Peter King's (R-NY) anti-Muslim hearings. For more information about Fox's false claims and misinformation about race and ethnicity, SEE HERE. Fox Regularly Misinforms About Gender While Promoting Sexism. As Media Matters has noted, Fox News regularly misinforms about, and makes false claims while reporting on, issues related to gender and often airs blatantly sexist segments, photographs, and remarks. For more information about Fox's false claims and misinformation about gender, SEE HERE. Fox Regularly Misinforms About LGBT Rights. As Media Matters and Equality Matters have noted, Fox News regularly misinforms about, and makes false claims while reporting on, issues related to LGBT rights, as well as being guilty of discrimination. For more information about Fox's false claims and misinformation about LGBT rights, SEE HERE. Also visit our partner organization, Equality Matters. Fox Regularly Misinforms About Religion, Often By Attacking Islam And Inventing A Supposed "War On Christmas." As Media Matters has noted, Fox News regularly misinforms about, and makes false claims while reporting on, issues related to religion. Among these false claims are those declaring that a "war" has been declared on Christianity and its holidays. For more information about Fox's false claims and misinformation about religion, SEE HERE. Fox Regularly Misinforms About Education. As Media Matters has noted, Fox News regularly misinforms about, and makes false claims while reporting on, issues related to public and private education, attacking educational outlets like Columbia University and Sesame Street. For more information about Fox's false claims and misinformation about education, SEE HERE. Fox Regularly Misinforms About Oil Drilling And Often Pushes Pro-Drilling Agenda.As Media Matters has noted, Fox News regularly misinforms about, and makes false claims while reporting on, issues related to domestic and international drilling, including the dangers of drilling domestically, as well as misinforming about the ability of domestic oil production to reduce the national price of gasoline. For more information about Fox's false claims and misinformation about drilling, SEE HERE. Fox Regularly Misinforms About Climate Change. As Media Matters has noted, Fox News regularly misinforms about, and makes false claims while reporting on, issues related to climate science. For more information about Fox's false claims and misinformation about climate, SEE HERE. Fox Regularly Misinforms About Energy And Conservation. As Media Matters has noted, Fox News regularly misinforms about, and makes false claims while reporting on, issues related to energy and conservation, regularly making false claims having to do with wind, solar and nuclear energy, as well as misinforming about energy efficient lightbulbs. For more information about Fox's false claims and misinformation about energy and conservation,SEE HERE. Fox Regularly Misinforms About Crime, Often Accusing Progressives Of Being Sympathetic To Criminals. As Media Matters has noted, Fox News regularly misinforms about, and makes false claims while reporting on, issues related to crime. For more information about Fox's false claims and misinformation about crime, SEE HERE. Fox Regularly Misinforms About Detention And Prisons, Particularly About Gitmo Detainees. As Media Matters has noted, Fox News regularly misinforms about, and makes false claims while reporting on, issues related to detention of prisoners. In particular, Fox regularly misinforms about Gitmo detainees and the conditions at the controversial detention center. For more information about Fox's false claims and misinformation about detention, SEE HERE. Fox Regularly Misinforms About Guns and Gun Control, Often While Using Violent Rhetoric. As Media Matters has noted, Fox News regularly misinforms about, and makes false claims while reporting on, issues related to guns and Second Amendment rights, often while engaging in violent rhetoric. For more information about Fox's false claims and misinformation about guns and gun control, SEE HERE.